Since his days with Lisa Bonet all the way up to "American Woman," we've seen many versions of Mr. Lenny Kravitz. And, considering each era involved some sort of shirtless-ness, we're totally not complaining. His most recent foray into interior design doesn't involve any skin-baring looks, but it's piquing our interest in the rock legend in a whole new way. Since launching Kravitz Design, Zoe's papa has been spending a bit of time in the 305 — not only did he wave his magic wand at the Florida Room at the Delano Hotel, but he can also take credit for that sick penthouse apartment and recording studio at the Setai. Now, he's at the helm of the Paramount Bay, improving the 47-story residential tower's spa, fitness center, lobby, driveway, pool area, and other outdoor spaces. His goal is to combine urban chic with waterfront living by focusing on comfortable luxury. Our only question: Will he be on hand to give us a tour? 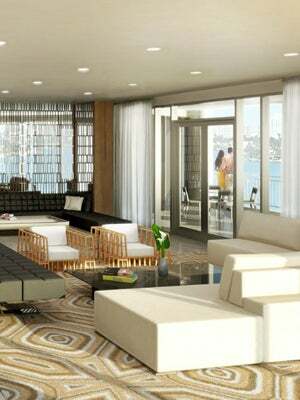 Paramount Bay, 2020 North Bayshore Drive; 305-374-2757.